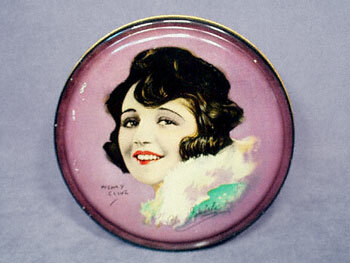 This is a Beautébox tin made by CANCO, and it features a likeness of Bebe Daniels drawn by Henry Clive. It includes the printed signature of Clive towards the bottom left, and the printed signature of Daniels towards the bottom right, with the words "Paramount Star" underneath. This tin is 7-5/8" in diameter, and 1-1/2" deep. There are no dents, and only minor scratching in the enamel as seen in the photo.